[CLOSED] GOLF FORTH AND WIN! Win a £50 American Golf voucher! With spring getting into full swing, it’s time to dust off those drivers and ‘putt’ yourself back on the green for golf season! 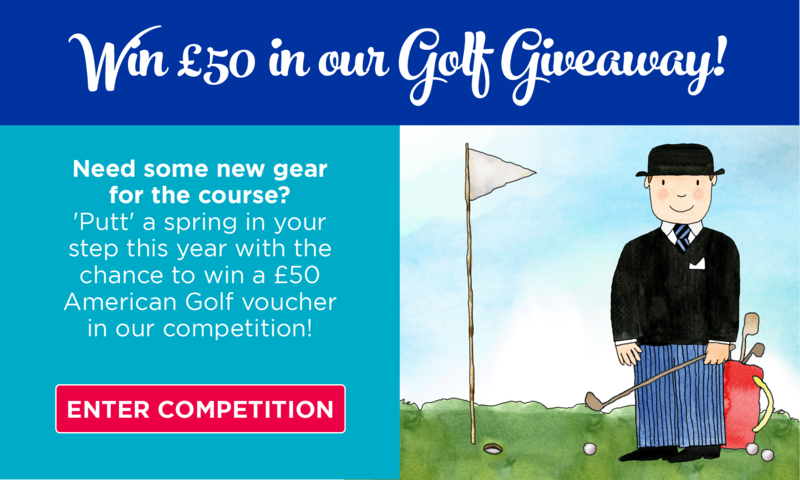 At The Insurance Emporium, to help encourage you to get back on course, we’re offering one lucky winner a £50 American Golf voucher to spend on some swanky new gear. Maybe you fancy a new set of golf balls* after losing a few on the course last year. Perhaps you’re looking for a new bag for your trusty set of clubs and could do with a bit of help paying for it. You could enter our Golf Forth and Win! giveaway for the chance to win an American Golf voucher to help with the cost! We love to help people pursue their golfing passion and this competition could be just the ticket to some goodies for when you’re on the green. All you have to do is enter your details in the competition form below and you’ll be in with a chance to win! This competition is now closed! Thank you for your entries! Once you’ve bought your new equipment, you might wish to look at insuring it in case anything goes awry. At The Insurance Emporium, our Golf Insurance policies include such benefits as Golf Equipment cover and New For Old for up to 4 years. Plus, you could get up to 30% discount^ if you’re a new customer! If you think that this could help to keep your golf adventure on course, stop by The Insurance Emporium today! *Golf balls are excluded from Golf Equipment cover. ^30% discount is made up of 20% Introductory Discount and 10% Club Member Discount.